Rick 2.0 is now unlocked, and while Mr. Burchett attends his son's graduation in New York, somewhere he's looking at his smartphone and he's blushing, because you guys did what he sincerely thought wouldn't be done. I'm telling you right now, we'll be making an "unboxing video" of Rick getting his new set-up and putting everything together. We'll keep you posted post-Campaign's conclusion, but, on Rick's behalf as well as Eric and myself, thank you all. The HMS Pegasus Deckplans are all that remain. On a similar subject, I spent an hour on the phone with Sterling Hershey last night in a discussion about the maps we're now able to produce, and the larger portion of that conversation ended up in a discussion of what shape the atlas image should take, and, in turn, what is the shape of the Sphere. As I told Sterling - who I suspect is much smarter than I am - I know just enough science to be dangerous. The challenges of bringing a sense of realism to our fantasy are daunting, and the creation of an actual world map is both exhilarating to me and terrifying. I'm very, very grateful that your support has allowed us to bring Sterling aboard for this work; not only the book, but our story itself, will be the better for it. A couple of folks have sent me messages asking if the digital edition of the trade could be available in a format other than PDF, and they've cited some excellent reasons, including one or two of which I'd not been aware. The primary argument in favor of offering additional electronic formats seems to be that PDFs simply are not ideal for reading comics, and a desire for consistency and ease-of-use is, honestly, very persuasive. At the same time, my understanding is that PDF is ideal for text, or text-heavy, documents. Eric, Rick, and I are now actively exploring our options. My suspicion is that we'll attempt to provide Lady Sabre & The Pirates of the Ineffable Aether, Vol. I, in CBZ or similar; the Annotated Process and the Pocket Guide - both primarily text offerings - will likely remain PDF. If you have thoughts on this, or suggestions, please feel free to share them in the comments section. Today, we're adding a tier for Karl Kerschl's original art for the pin-up of Lady Sabre. This is the same image we've featured on our Story page (the main Kickstarter page) from the start. As with the previous offerings, Karl's piece will come with a copy of the trade in the Style to Which She is Accustomed edition, and include all the digital options. It seems I can't go more than a couple of days without talking about games as much as we talk about comics. Well, today, I became aware that Chaosium has launched a Campaign to produce and distribute the 7th Edition Rules for their venerable and still brilliant Call of Cthulhu RPG. I love this game. This is, in fact, the only game I'm actively running these days. It is a brilliant and elegant game system, designed to promote storytelling in a world of unknowable horror and globe-spanning adventure. It is a game system that allows for role-playing of the highest order. It is a great game, inspired by the works of HP Lovecraft, full of mind-rattling enemies and universe-ending threats. It's a game that rewards thought, and was one of the very few games I found early that eschewed the violence of D&D and the like for creative, intelligent solutions. After all, as the game itself once wrote, "What happens when you nuke Cthulhu? He reforms ten minutes later. But now he's radioactive." Hey, Evan? "Are they real crocodiles?" "They're real HUGE crocodiles." Or is it alligators? I can never remember which…. Justin Peniston, who has been doing the webcomic Hunter Black for almost exactly as long as we've been working on Lady Sabre, is a talented and hungry young writer, and he's got a new all-ages book being released this coming Wednesday via the Comixology app. 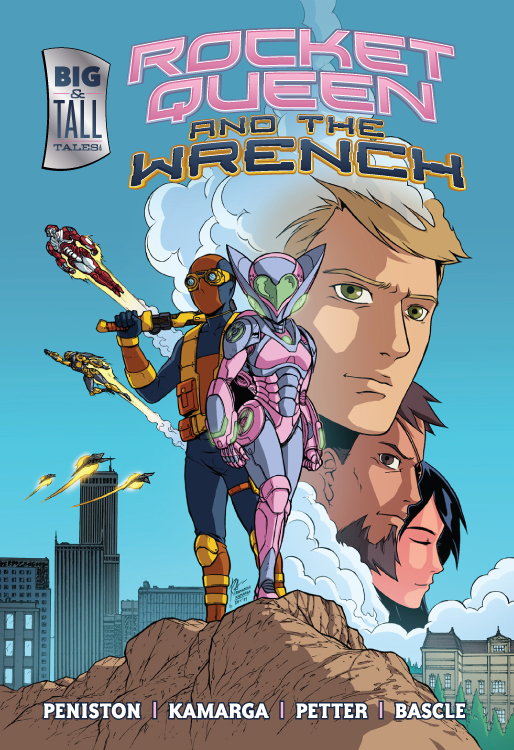 This is a creator-owned, self-published comic, available only digitally. Please consider giving Justin your support and checking the book out when it's released this coming week. "As I recall, your investigator was already in the lake after falling off the bridge." Thanks Greg, and now there’s another Kickstarter to which I must pledge my money! Okay, you were in Egypt, not Louisiana; ergo crocodiles, not gators. Really, the crocodiles quote has really gotten blown out of proportion over the years. I mean you all were in the ancient tomb of a priest of Nyarlathotep. There was a rope bridge spanning a huge lightless lake, and I told you all the lake was swarming with albino crocodiles. And someone has to ask me "Are they REAL crocodiles?" Well, duh. This is Call of Cthulhu after all. Of course, maybe they could have been mummified crocodiles, though that really would not have gone well in the water. Unless they were animated zombie mummified crocodiles. In a lake of blood. Anyway, they will always have to be "real HUGE crocodiles." The real take away from that game was, who needs monsters when one of the player character investigators becomes severely paranoid? I just handed you-know-who a note that said something like "They are all out to get you. Do something about it while you have the chance," and the next thing you know, he pushes one investigator over the edge into the lake and bashes his other companion upside the head with his nightstick as he came off the bridge, also resulting in a plunge into the lake. As I recall, your investigator was already in the lake after falling off the bridge. That was really a helpful way to distract your friends, so I could unleash you-know-who’s madness. And of course folks, who managed to walk away from that? Oh yeah, Greg. Basically unscathed. Just don’t get me started on the games Greg ran. Screaming and running. And that’s just from the players, never mind the characters. I'd also vote for a CBR/CBZ option in addition to the PDF. It would likely be a huge file, but I'd be ok with that in exchange for what I think is a better digital reading experience. More importantly, congrats on you guys exceeding this stretch goal. An amazing artist like Rick should have the best tools. Now on to those deck plans! I'm glad you are looking at /adding/ additional formats...It may not be "ideal" but I prefer PDFs. They are lovely and simple to use in my iBooks reader. I'm glad you've been exhilarated and terrified. Job well done, I say! If the book will be available on Comixology you could provide a gift/promo code for that version. There also needs to be a DRM free alternative of course. If some people are concerned about archive/document size maybe provide several quality levels of varying size? Personally I think quality is king, so bring on the massive files I say. Yes, yes, yes; it's an "all go" on RICK 2.0! After 30 years in the business, the only character that only Rick has ever worked on has become his vehicle to make his work easier: how cool is that? I'm so excited for you guys! Hold fast! Mark -- We'll definitely opt for an extra format options, rather than an either/or. My hesitation on the CBR file is that I think it will be gigantic in size, and I still want all text pages to be readable, but I'm happy to do my best to give the people what they want! I use a Kindle Fire HD 8.9 for my digital comic reading, and for the most part .PDFs work fairly well and can be used with the default Kindle Document reader. If possible, perhaps you could both provide .PDFs and .CBR versions? Just my 2 cents sir! What are the sizes of the pin-up art?